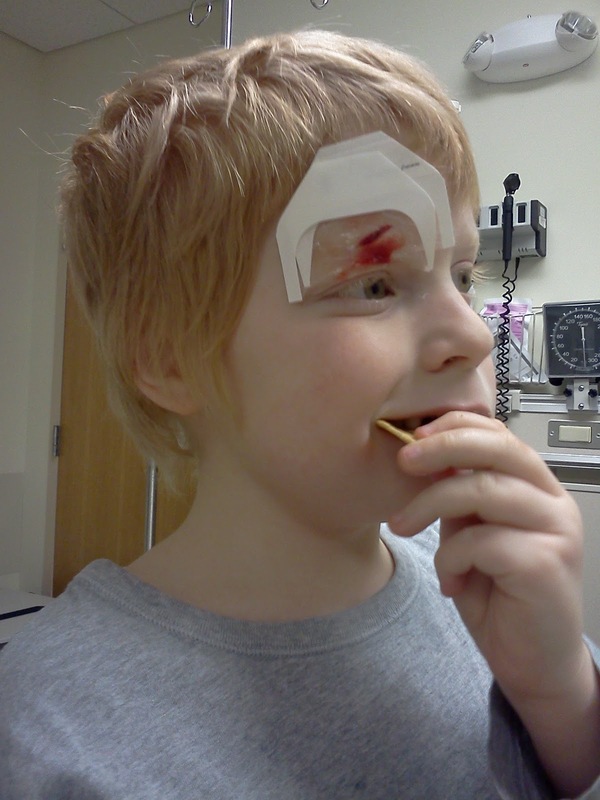 Yesterday we spent eight hours in our local ER so Brian could get stitches. Sure getting stitches is hard for any child but have that child have autism, a language barrier, sensory dysfunction, and just a general confusion of what exactly is going on and it becomes a nightmare. When we first arrived at the ER Brian was still in shock. I had to carry him in, he wasn’t making any vocalizations, and was limp. His lethargy scared the hell out of me. My little boy is never still for more than a minute. The nurses fussed over him and looked at me like I was just trying to blow things out of proportion when I told them upfront he had autism and this was going to be a difficult visit. He allowed them to take his blood pressure and temperature without even moving on my lap. They continued to roll their eyes at me. We finally got back to a room where it took forever for a doctor to come in. When she finally did she started drilling him on how he got the gash on his forehead even though I had already told her he had fallen in the bath. For a few minutes I thought she was just being friendly and then I realized she really didn’t know he couldn’t talk…wasn’t that the whole point of telling the nurses up front so it could be carried along? I said, “He is functionally non-verbal.” The doctor looked at me and said, “Really? Do they know why?”. So I took another fifteen minutes explaining he had autism and what that meant as it related to our ER visit. After my long explanation she told me her plan was to put on numbing cream, wait 25 minutes for that to work, then do a numbing injection, and then the stitches. I laughed. Seriously, laughed out loud. As soon as they tried to get the numbing cream on the gash my boy finally came out of his shocked stage. The young doctor looked at me and I swear her eyes had tripled in size while it took three professionals to apply the cream. She left, shocked, not saying a word. She returned another twenty minutes later asking me to sign a release for him to be sedated. We waited for hours to be sedated. And my boy ran around, laughing, skipping, and yelling “I’M HERE!”. He was an angel. He had much more patience and cheer than I did. Finally it was time for his injection. I watched as the blue scrubs filled the room. They were prepared this time. Five adults to hold him down and he still managed to break free and grab the gauze off the injection site. My eyes welled up as I watched his eyes roll in the back of his head. I swallowed hard because there was no way I was falling apart at that point. 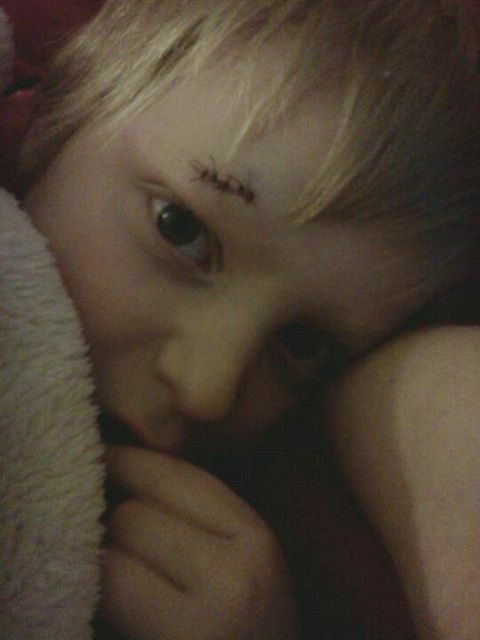 I was going to hold his little hand through the stitches. I would not leave my baby on that table all by himself. The stitches were quick, only five of them, but even so he started to stir out of the sedation before it was even done. His arm, that I wasn’t holding, reached up to push the doctor’s hand away as she worked. The doctor’s eyes again grew as she exclaimed she had never seen anyone come out of it so soon. We spent another lifetime waiting for the effects to wear off as his stomach did not agree with it. Vomiting over and over again despite the anti-nausea medicine they gave him. However he kept smiling and rubbing my cheek and saying “Home”. And finally we left- leaving a trail of vomit behind us even in the waiting room. 8 hours and 5 stitches later. Now the real adventure begins of trying to have him keep a bandage on for at least a week and no picking for three weeks. All of that for this little scar.